Where was I? Oh yes eyeliner... Basically I saw that YSL had an amazing Waterproof Eyeliner in Azure Blue which is the most stunning colour. I kept talking about it in a "She will be mine, Oh yes, she will be mine" (Wayne's World anyone?) kinda way. I was so lucky when An Angel from Heaven gave it to me for my Birthday (maybe it was to shut me up talking about it - I am not sure). I am in Love - its such a beautiful blue colour - I know to some that blue on the eyes is a little 80'ies (I happen to love the 80'ies) but this manages to be both bold and subtle at the same time. I find that the liner doesn't last all day on my waterline but most liners don't last long on my waterline (what can I say its a watery waterline). The liner costs €26.00 which is a bit gasp inducing but "in all fairness to them" (I have been watching too much football) they include a sharpener which is a nice touch by YSL. It looks gorgeous on you, really makes your eyes pop (in a non-scary/weird way). 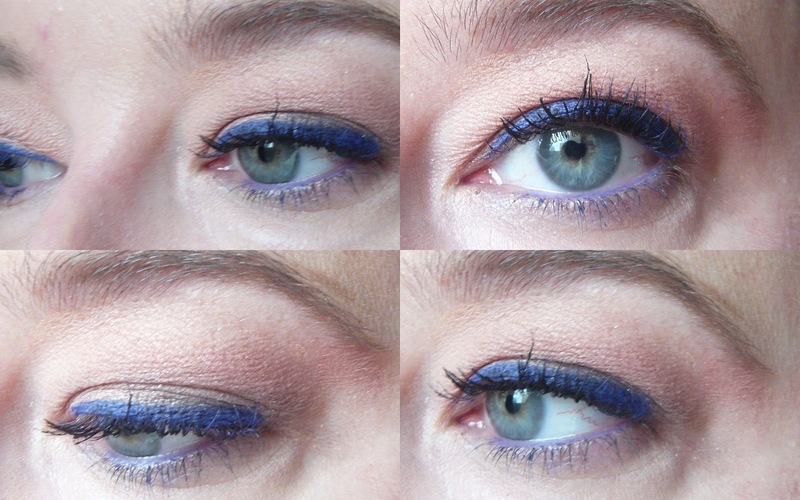 Look Great with your eye color! It's so gorgeous on you Mags, it's one of my favourite liners probably ever. Loving your nails too! Pirouette My Whistle isseh?